It’s Election Day folks! If you’re reading this and live in the United States, make sure you either have voted or will vote. It’s incredibly important. Speaking of politics, a movie that focuses on a moment where the political landscape changed forever is about to open. It’s The Front Runner, Jason Reitman’s latest work. By looking at Presidential hopeful and now cautionary tale Gary Hart, Reitman and company shine a light on how coverage of candidates and candidacies themselves have shifted. It’s a compelling film, one filled with strong performances, as well as a timely nature that can’t be ignored. This is literally the perfect week for it to be hitting screens. 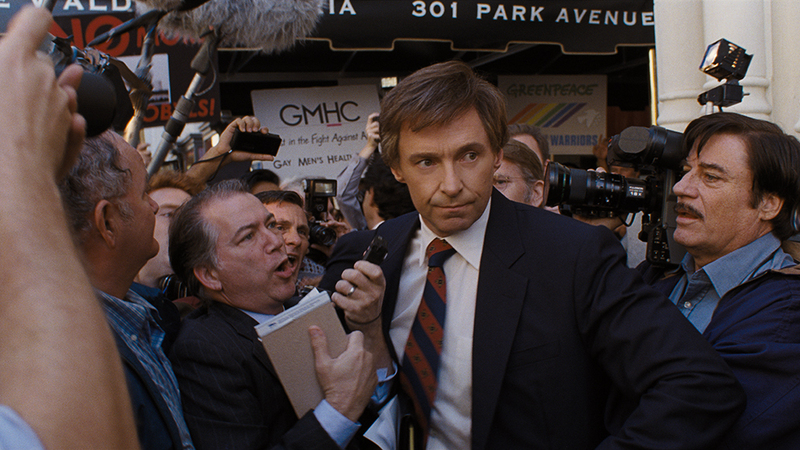 The Front Runner is a political drama/pseudo biopic. After coming up short the last time around, Colorado Senator Gary Hart (Jackman) is considered the 1988 Democratic front runner for President, and all but assumed to be the nation’s next leader. Having inspired many during the previous primary, he’s all but a shoo in. Then, scandal hits. Rumors of extramarital affairs have dogged him and his wife Lee Hart (Vera Farmiga) for years, but until now, the press has never really covered politicians’ personal life. That all changed with Hart, especially once his dalliance with Donna Rice (Sara Paxton) is tipped off. As journalists like Ben Bradlee (Alfred Molina) debate whether to cover Hart’s love life, his political operatives like Bill Dixon (J.K. Simmons) struggle to make sense of it all. We know how it ends, but the film does ask if the country lost a potentially great leader to a scandal that didn’t have anything to do with his ability to govern. It doesn’t take a stance, but rather lets you decide. Reitman directs and co-writes with Matt Bai and Jay Carson, adapting Bai’s nonfiction book. 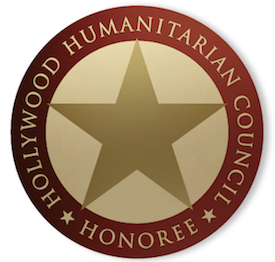 The ensemble cast also includes Bill Burr, Kaitlyn Dever, Molly Ephraim, Ari Graynor, Alex Karpovsky, Kevin Pollak, and many more. Eric Steelberg again provides the cinematography for Reitman, while another returning colleague for him is composer Rob Simonsen. This is easily Jason Reitman’s most timely work to date. 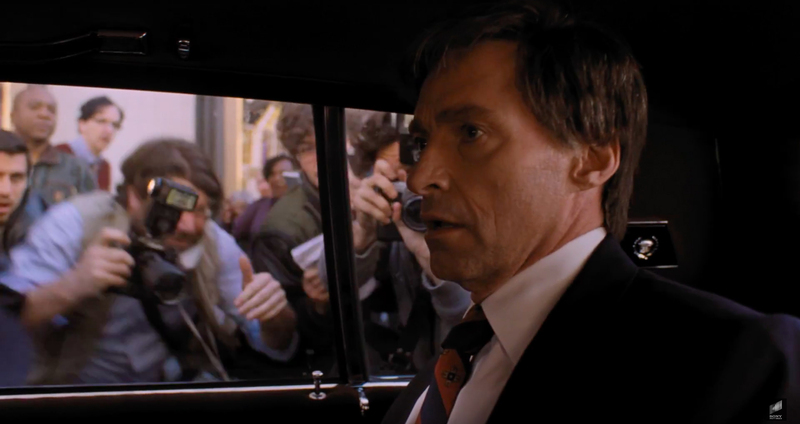 Armed with a strong turn from Hugh Jackman, Reitman is able to place us right in the middle of Gary Hart’s ill fated campaign for President. It’s captivating from start to finish. Jackman gives us the good and bad of Hart, allowing us to see the flawed individual who may just have been the best President we never had, right alongside Bobby Kennedy. Reitman’s filmmaking is also his most ambitious yet. Echoing Robert Altman at times, he drops the audience right into the thick of it and trusts you to catch up. That trust pays off in allowing the whole thing to feel truly authentic. Awards wise, The Front Runner could face an uphill battle this season. It already was feted at the Hollywood Film Awards over the weekend, with Hugh Jackman getting the Actor prize, but Oscar may be a tougher sell. Still, Sony would do well to give this one a big time campaign. 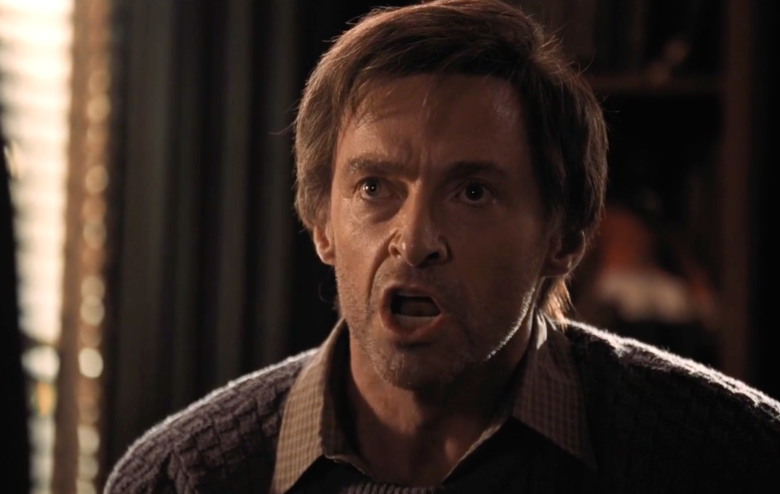 Efforts in Best Picture, Best Director (for Reitman), Best Actor (for Jackman), Best Supporting Actor (for Simmons), Best Supporting Actress (for Farmiga and/or Paxton), Best Adapted Screenplay (for Bai, Carson, and Reitman), Best Cinematography, Best Film Editing, and Best Original Score would make sense. Realistically, Picture, Actor for Jackman, and Adapted Screenplay for Bai, Carson, and Reitman are where the focus should be though. Especially in Actor and Adapted Screenplay, the film has a shot to contend. Be sure to check out The Front Runner, in theaters this week, before expanding nationwide throughout the month of November!